I built a copy of the John Cukras chassis pictured on pages 16 and 17 in Car Model, September 1968, which Cukras drove to win the second Los Angeles Car Model race in April 1967. I took a few pictures as I made it. The pictures tell the story, but I'll put a few words to explain things further. Let's get started. 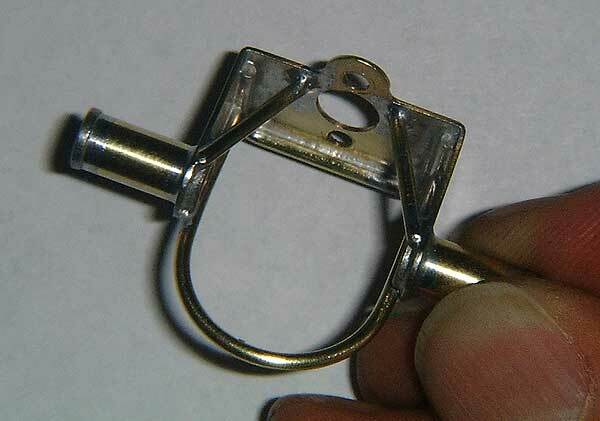 Get hold of a Russkit bracket and bend up the pieces of brass rod as in the picture above. The pieces of tube for the oilites need to be cut perfectly square. If you have a lathe, fine. If not, do what i do - cut the tube about a 1/4" longer than you need it to be, then put it in the chuck of a regular electric drill. Start the drill up on the fastest speed. Next get your dremel with a cutting disc in, and start that up. Make sure as you cut the tube that you hold the dremel nice and square to the tube. Once it's cut off, turn the dremel 90 degrees to the electric drill and just touch the tube with the spinning dremel to finish the job off. MAKE SURE YOU WEAR GOGGLES WHEN YOU DO THIS! 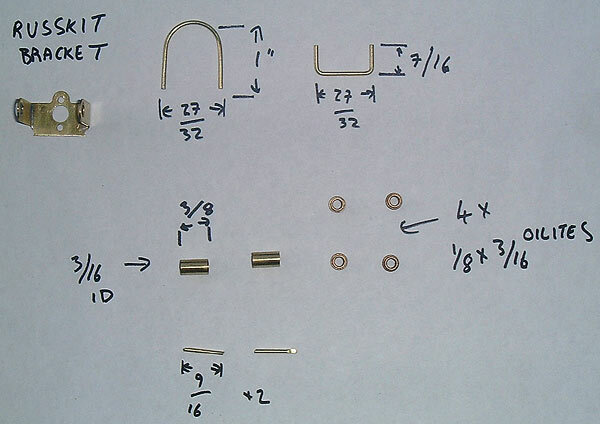 Solder the whole thing up WITH AN AXLE IN TO LINE IT ALL UP, and it should look like this, below. Go on to Page 2.